Western blot analysis of extracts from SK-N-MC cells, treated with forskolin (FSK) for 30 minutes or λ phosphatase for 1 hour, using Phospho-β-Catenin (Ser675) Antibody (upper) or β-Catenin Antibody (Amino-terminal Antigen) #9581 (lower). COS-7 cells were transfected with cDNA encoding DYKDDDDK-tagged wild type (WT) β-catenin or Ser-to-Ala β-catenin mutants as indicated. Cells were stimulated with 10 mM forskolin (FSK) for 5 minutes and lysed. β-catenin or its mutants were immunoprecipitated with DYKDDDDK Tag Antibody (Binds to same epitope as Sigma's Anti-FLAG® M2 Antibody) #2368 and analyzed by western blotting using Phospho-β-Catenin (Ser552) Antibody #9566, Phospho-β-Catenin (Ser675) Antibody or DYKDDDDK Tag Antibody as indicated (Figures provided by Drs. Sebastien Taurin and Nickolai Dulin, Department of Medicine/Pulmonary, University of Chicago). 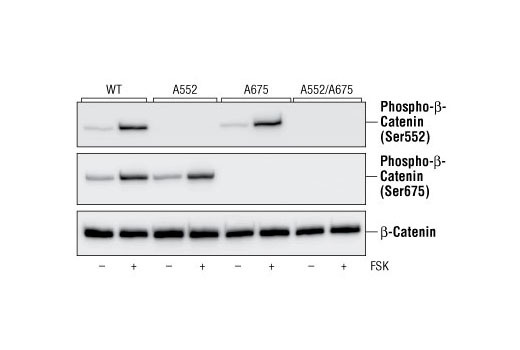 Phospho-β-Catenin (Ser675) Antibody detects endogenous levels of β-catenin only when phosphorylated at Ser675. Polyclonal antibodies are produced by immunizing animals with a synthetic phosphopeptide corresponding to residues surrounding Ser675 of human β-catenin. Antibodies are purified by peptide affinity chromatography. 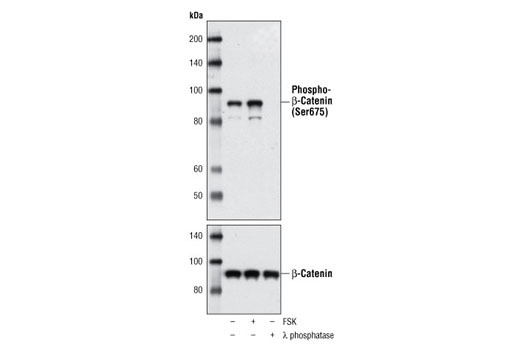 PKA was shown to phosphorylate β-catenin at Ser675. Phosphorylation at Ser675 induces β-catenin accumulation in the nucleus and increases its transcriptional activity (9,10). Taurin, S. et al. (2006) J. Biol. Chem. 281, 9971-9976.